He shares my birthday, my misguided misanthropy, and my fascination with weird, alien creatures. I am most weary of Cyclopean architecture, adjective laden second-hand reports, and dead gods that stink of fish. The back cover review from Stephen King declares saucy H.P. "unsurpassed" in twentieth century horror. 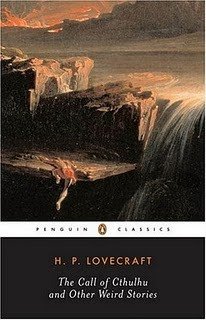 Lovecraft was surpassed by plenty! Edgar Burroughs and C.L. Moore to name contemporaries I have read. Stephen King and Neil Gaiman to name his (superior) disciples of the creepy. Sour grapes, you say? No doubt about it. I simply couldn't find many juicy thrills in these tales. Influential? Absolutely. Bookmonkey is quite fond of him, as many are, and I am fond of Bookmonkey, so I don't want to get caught up in a rant. I think what frightened me most was the worry that the man might infect me from beyond the grave with his clinical, paranoid, hateful attitudes to his fellow hu-mons. Do ALL unendurable creatures from beyond walk hand in hand with the 'degenerate, mongrel races'? I don't suppose (upon discovering one is not of PURE white blood) you could maybe... I dunno, NOT set yourself on fire? I was glad to have read a classic I've heard so much about. I now get an even bigger kick out of the song "The Innsmouth Look" by The Darkest of the Hillside Thickets. Miscegenation! For me, probably thanks to Star Trek, the unknown is to be desired, not rooted out. Don't get your advice on outsiders from a shut-in, no matter how scholarly. Cthulhu was pretty cool, though. This April 2, give him a big hug on his deathday!